Timothy Park, EdD, Director of Spiritual Health at Emory Johns Creek Hospital; Geshe Phende, Tibetan Monk, Drepung Loseling Monastery; Marilyn Margolis, Emory Johns Creek Hospital CEO; Praksha Patel, Hindu Religious Teacher; Noor Abbaday, Islamic Speakers Bureau; Cantor Nancy Kassel, Temple Beth Tikvah; Kathleen Rieter, Interfaith Consultant. 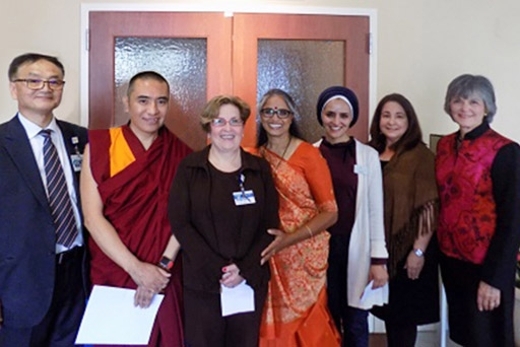 Emory Spiritual Health held its annual interfaith open house at Emory Johns Creek Hospital on Oct. 24. The group discussed with staff best ways to accommodate interfaith patients during a hospitalization or health crisis. "Understanding a patient's spirituality helps us create an individualized care plan to best serve patients and their families," says Marilyn Margolis, CEO of Emory Johns Creek Hospital. The interfaith open house featured speakers from various faiths including: Buddhism, Hinduism, Judaism, Christianity and Islam. "Our interfaith patient education teaches staff basic beliefs of several faiths, rituals and customs," says Timothy Park, EdD director of spiritual health at Emory Johns Creek Hospital. During a hospitalization, families of different faiths may have particular requests to make their loved ones comfortable and to honor rituals. For instance, Park says according to Hindu beliefs some patients may prefer same-gender caregivers. "Jewish patients may find comfort in the recitation of the "Vidui", a confessional prayer in preparation for death," says Park. "Christian patients may request communion, prayer or anointing with oil." "Some Muslim patients desire to recite or hear the Quran. Whereas, Buddhists want to recite mantras and meditation to keep their mind calm during a time of illness." Park says honoring patients' spirituality expresses our hospital's commitment to putting patient care at the center of everything we do. Emory Spiritual Health includes a team of 46 full-time staff and 52 part-time staff who serve across the Emory Healthcare System. For more information about spiritual health at Emory Johns Creek Hospital, call 678-474-7191.